CAIRO, Egypt (CNN) -- Israeli and Hamas negotiators have "almost reached agreement" on a long-term truce for Gaza, a spokesman for Hamas told CNN early Friday. 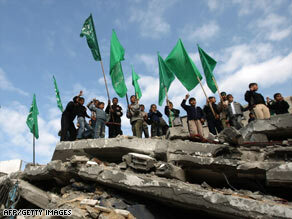 Hamas supporters stand on the rubble of a building hit by an Israeli strike. Tahir Annono, who is in Cairo for the truce meetings, said that more meetings would take place Friday and Saturday, and on Sunday an announcement would be made. It was not immediately clear if Israel was in agreement. Hamas' deputy leader, Moussa Abu Marzouk, said that the truce would last for 18 months and that all commercial border crossings between Gaza and Israel would be opened. Marzouk spoke after a meeting at a Cairo hotel between representatives of Hamas and Egyptian intelligence officials. Egypt has been working to broker an agreement between the two sides. Israel and Hamas, the Islamic militant group that has ruled Gaza since 2007, declared separate, tentative cease-fires January 21 following more than three weeks of fighting in Gaza. Marzouk said that any discussion of a prisoner exchange was "a separate issue" that had "nothing to do with the truce."